Chris and I snuck off to London for a few days a couple of weeks ago with the main purpose of attending a very exciting event (hint/spoiler). But first, we spent a few days in one of my favorite cities doing a few things I had yet to cross off of my London bucket list. Attending afternoon tea ranked high on that list, and I discovered the perfect place to do exactly that. 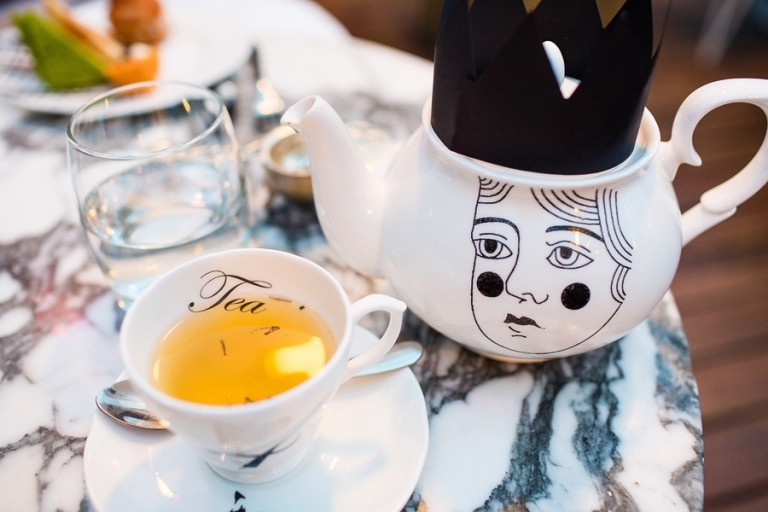 Sanderson in West End offers just about the cutest afternoon tea I could have imagined with a Mad Hatter theme to make us feel like we stepped right into the beloved Alice in Wonderland fantasy world. 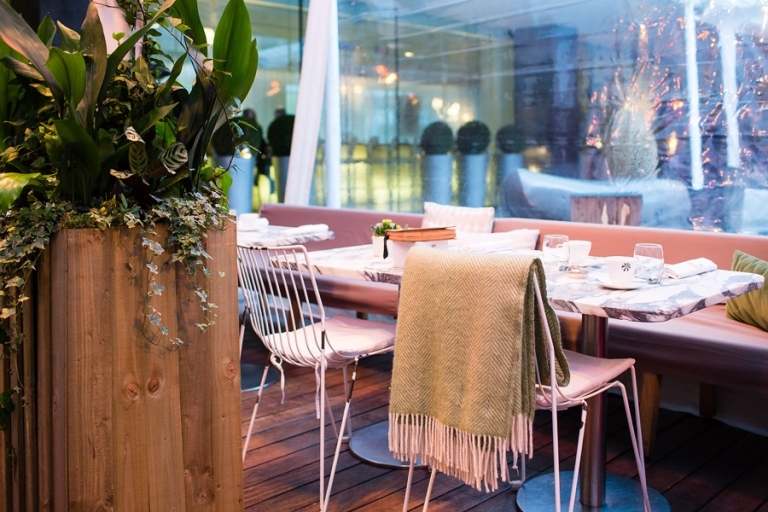 We arrived in London on a bit of a cold and dreary day, in fact we were nearly drenched walking to Sanderson in the pouring rain, so I was happy to see that the courtyard garden provided a lovely spot to warm up not only with hot tea, but with cozy blankets and plenty of heaters. Our reservation at 2:45pm meant we were seated right away, and the service was welcoming and quite friendly. Of the wonderfully fragrant teas to choose from, I selected the tea party’s namesake, Mad Hatter, and Chris tried Alice. Both were delicious, and I regret not purchasing one of each to bring back home! 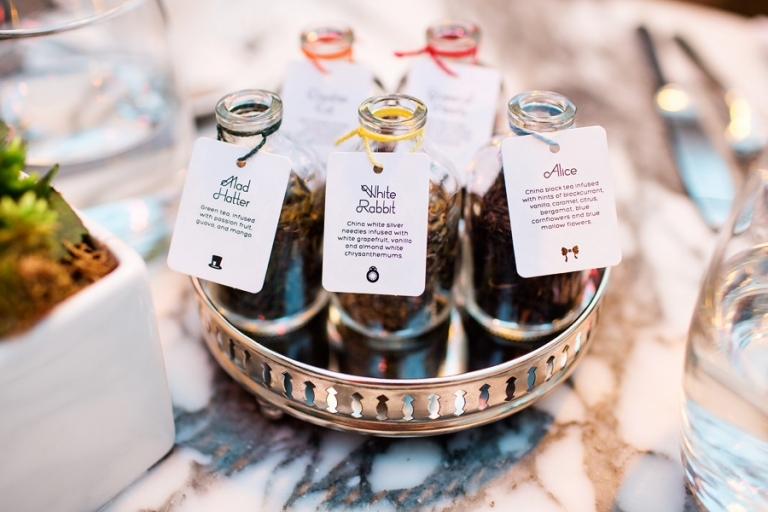 The loose leaf teas are available to take for £12-15 each. We had yet to eat breakfast or lunch after stepping off the plane, so we were both ravenous and all too excited to head down the rabbit hole and try each of the goodies in the savory selection. 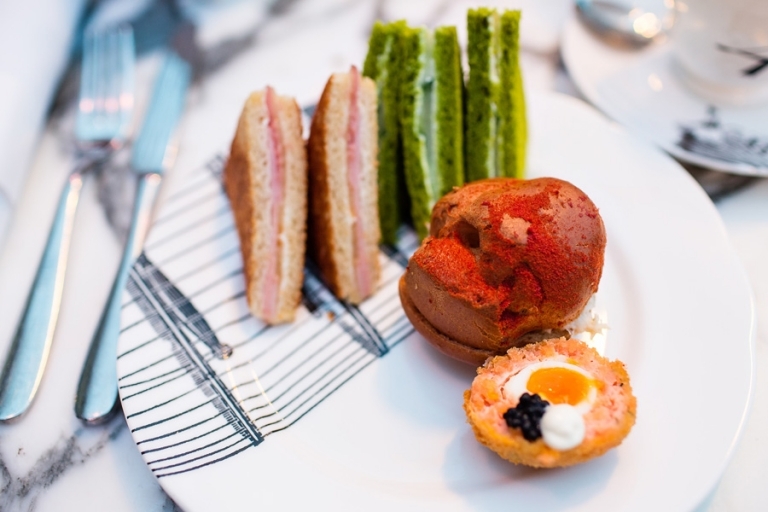 Classic cucumber sandwiches, goat cheese croque-monsieurs, crab and herb eclairs, and smoked salmon and caviar Scotch eggs filled our bellies. We were even offered additional savory rounds (the savory plates are unlimited!) before the sweets portion of the menu. I could have eaten quite a few of those croque-monsieurs, but I knew I needed to save room for the massive tower of confections up next. The multi-tiered serving dish offered sweets of every color, shape, and size. I felt like a kid (in a candy store!) every time I selected a different candy caterpillar, marshmallow mushroom, or drink me potion. My absolute favorite ended up being the rich chocolate Queen of Hearts cookie soldiers, but I also loved the banana bread-and-butterfly. And the scones. And the White Rabbit’s pocket watch macaron. And just when we thought we couldn’t possibly eat or drink another thing, we received a surprise ending – ice cream served in a tiny flower pot with cookie crumble topping, bits of honeycomb, and an edible flower. Sanderson definitely nailed the Mad Hatter theme, and afternoon tea couldn’t have felt more whimsical unless the Cheshire Cat himself was grinning at me from a corner in the room. 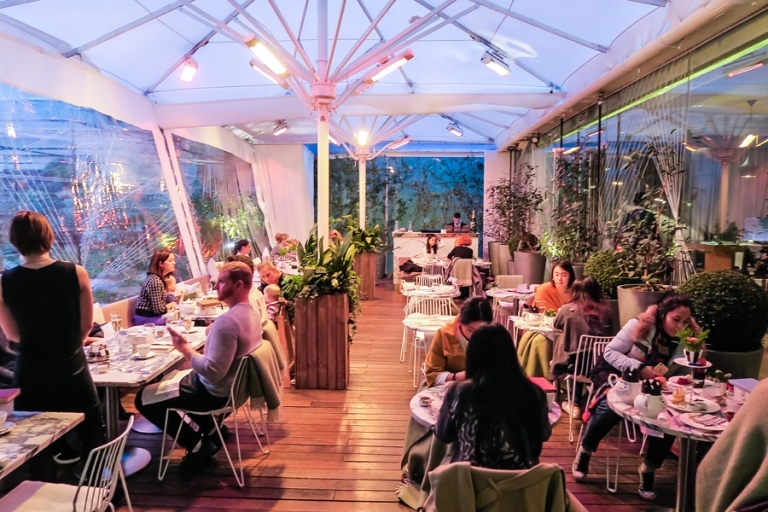 At £48 per person, afternoon tea at Sanderson is perhaps a bit of a splurge, but it’s perfect for a special occasion though fancy dress is not required. We noticed a pair of friends at the table next to us celebrating a birthday (or maybe an unbirthday?) and they received some special birthday treats. Occasion or not, I definitely recommend this experience! Susan - Tiny flower pots! I’m a sucker for miniatures.